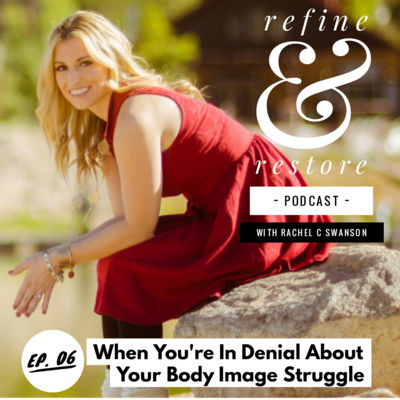 The podcast that helps you Refine the areas or lies in your life that are holding you back and Restore your heart and mind back to what is true. 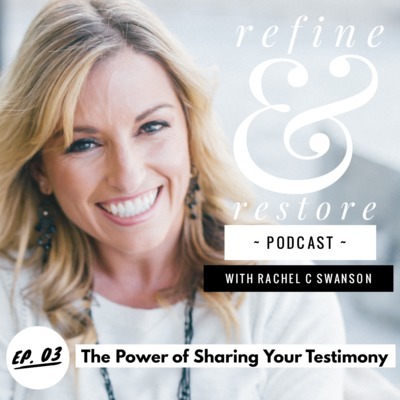 From relationships, faith, family, health, purposeful living, personal and spiritual growth, Rachel C. Swanson (best-selling author, speaker and accredited coach) provides power-packed insights in 20 minutes or less, guaranteed to transform your life. So much of the time, we shove away the thoughts. We don't want to engage or wrestle with them. But friend, it's okay to wrestle...in fact, this may be exactly what you need to do in order to discover who you are and the truth about God. 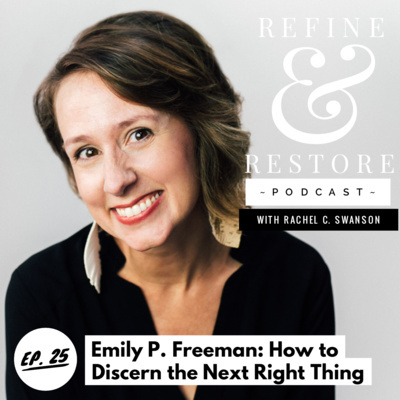 In this episode (#24) I unpack: The current areas of my life that I'm wrestling with: my faith, emotions, and roles. Why it's good and healthy to wrestle with these things. What the Bible has to say about wrestling with God. How to response to people who are wrestling with issues in their faith, relationships, etc. I think we need to be more authentic with one another and share what we're wrestling with, as well as respond to others who are wrestling with more grace, love, and compassion. What do you think? Sometimes, I feel like giving up: on relationships, my kids, my career, and even my faith. But what if there's a pivot God is inviting you to see with Him? Maybe you just don't see it yet? 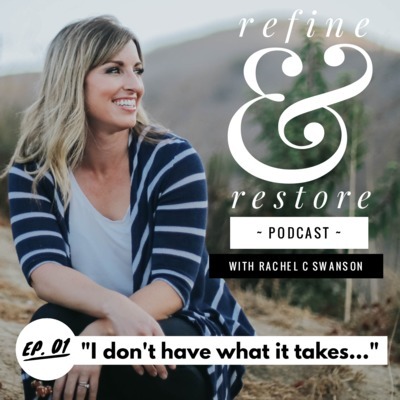 In this episode (#23) I share: Areas of my life where I've contemplated quitting. A story in the Bible that made me think that perhaps God has a pivot in place, I just don't see it yet. Encouragement in your own season of when you feel like quitting instead. I'm thankful for those seasons that I haven't quit, even though I felt like it. I'm thankful that I've stuck it out only to see the pivot that was just beyond the next corner, leading to an even greater path and plan than I anticipated. Click to listen to this episode! Connect with me on Facebook! Connect with me on Instagram! If you haven't already, join the Inner Circle with my weekly Truthful Tuesday emails where I share weekly personal + spiritual growth tips, plus share exciting behind-the-scene updates about my faith-led adventures! 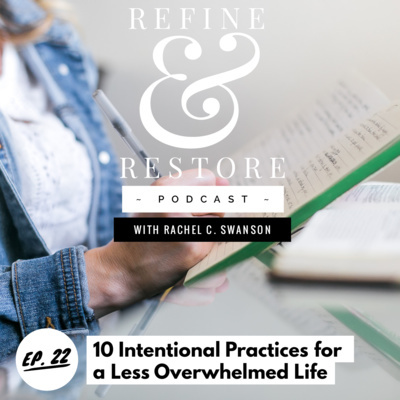 It’s episode 22 and I'm deep diving into 10 simple and intentional practices that I have put in place over my life in order to have less overwhelm and increase my productivity. This isn't so much of adding more to the weight of your schedule. It's about intentionally designing your life to be more balanced and intentional with the things we put in it. When I implement these 10 things, I feel the weight of stress and worry fall off my shoulders. I feel more aligned to my callings. I have less guilt and less distraction. All in all, it makes for a more healthy and happy life. 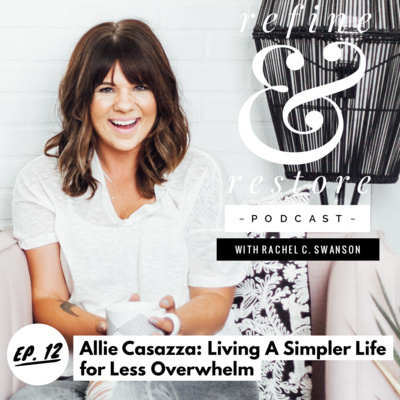 In this episode I cover: 10 things that I strive to do each day in order to bring less overwhelm to my schedule. A specific Proverb that has helped me let go of control to a certain extent. My favorite quote by Martin Luther. What things you can and cannot multi-task well with. How to make sure your spouse is on the same page as you. And more! I don't do this perfectly, but I do feel the state of my life is more intentional and less overwhelming than most. Listen to this episode! Connect with me on Facebook! Connect with me on Instagram! If you haven't already, join the Inner Circle with my weekly Truthful Tuesday emails where I share weekly personal + spiritual growth tips, plus share exciting behind-the-scene updates about my faith-led adventures! I had an entertaining chat with my guest Jenny Randle on today's podcast. Jenny calls herself a creative ninja which is fitting since she’s an entrepreneur, speaker, Emmy-award winning editor, and wrote a book called Courageous Creative to help unleash your inner creative. Some of you may not think you are creative, or think that being creative is a big deal. Perhaps you've even succumbed to the lie that God doesn't want you to dream or pursue those dreams with Him? 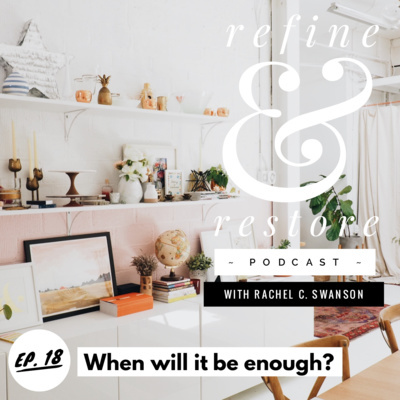 In this episode we cover: Alarming statistics about the drop in our creative energy as an adult, and why this is so important to get back. The lie you may be believing in about your lack of creativity. How being creative is biblical and a part of our origin. What tapping into our creative energies does for the soul (and why this is worth fighting for!) How to freestyle rap like a champ! (Or at least have fun with it!) 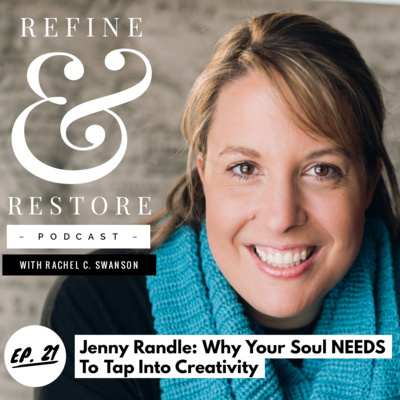 You will laugh out loud with this episode as well as get a big tug in your heart as you listen to Jenny's personal story of pursuing her inner creative, and how you should do the same. Click here to listen to this episode: Grab Jenny's book: Courageous Creative Connect with me on Facebook! Connect with me on Instagram! If you haven't already, join the Inner Circle with my weekly Truthful Tuesday emails where I share weekly personal + spiritual growth tips, plus share exciting behind-the-scene updates about my faith-led adventures! Have you ever had to wait on something when all you want to do is press forward? Waiting on a job, for a check, on kids to put their dang shoes on (or maybe that's just me?) Waiting on God's promise for something He may have demonstrated to you? Waiting for healing, waiting for rain, waiting for a dream to more forward? Have certain situations required your patience or caused frustration amidst the waiting? 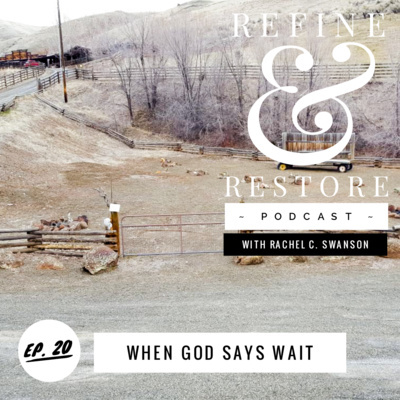 In this episode (20) I'm discussing: Our current standstill with the ranch and when God has asked me to wait... Does God actually call us to wait sometimes? What stories of the bible discuss this? Is there purpose in this waiting? What is the lie we are believing in? What areas of your own life is God asking you to wait and what might He be trying to teach you? Recently, God has been telling me to wait. To be patient. Something that isn’t exactly my strong suit. 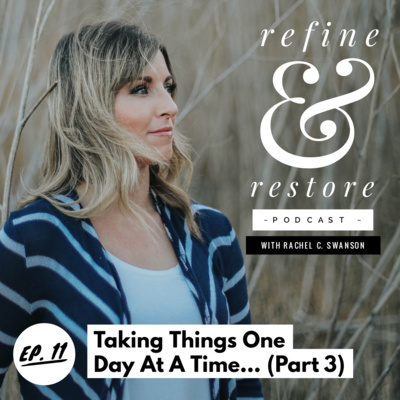 If you’ve ever been wrestling with the issue of waiting on God’s timing or being patient during challenging times, keep listening because I want to tell you what I’ve learned personally and found biblically through this process. Listen in to this episode! Connect with me on Facebook! Connect with me on Instagram! If you haven't already, join the Inner Circle with my weekly Truthful Tuesday emails where I provide coaching tips, encouragement, and share behind-the-scene updates about my faith-led adventures! 18: When will it be enough? 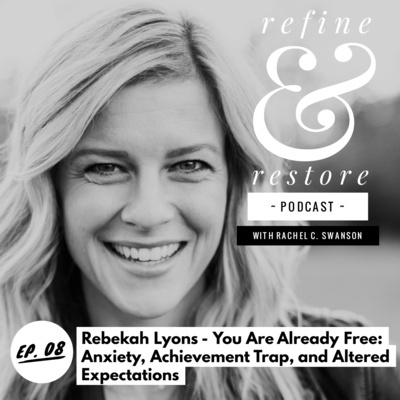 In this episode, it’s episode 18, I’ve been wrestling with this concept of enough over the past several years and have gotten to a really freeing place of being content with where God has me now. 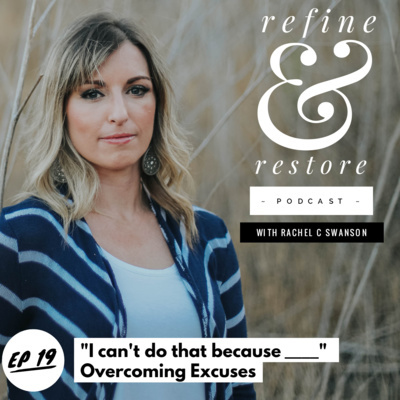 I’ve stopped striving and starting living into this current season with new perspective, and I want to help you shift your thinking with this too—to overcome the lie that you don’t have enough—and step into the truth that enough is right in front of you. In this episode I cover: How I've come into a season where we have less and yet I feel more content than ever. What God's Word says about contentment and having enough? What I have to do DAILY to restore my heart back to the truth about this matter. How you can become free from the glass-half-empty thoughts. What we really should be striving for and where our focus should be. We have more than enough friends. But sometimes we need to hear it from someone else who has not just talked the talk, but walked the walk. Connect with me on Facebook! Connect with me on Instagram! If you haven't already, join the Inner Circle with my weekly Truthful Tuesday emails where I provide coaching tips, encouragement, and share behind-the-scene updates about my faith-led adventures! I had an amazing conversation with Jennifer Dukes Lee in this episode. Jennifer is has actually become such a great friend that I met through social media a few years ago and she is the author of many books, but her recent one is titled It’s All Under Control. This is the episode for those that are trying so hard to do everything for everyone. You have a ton of plates spinning in the air and you feel very responsible for whether or not they stay up or fall. And then at the end of the day you feel weary, wondering if you did enough, and peace just isn’t there. 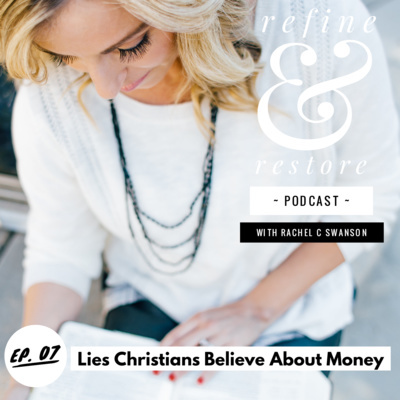 By the end of this episode you won’t feel so alone in this struggle, as well as Jennifer gives us so many nuggets of wisdom to help us point out the lies from the truth. 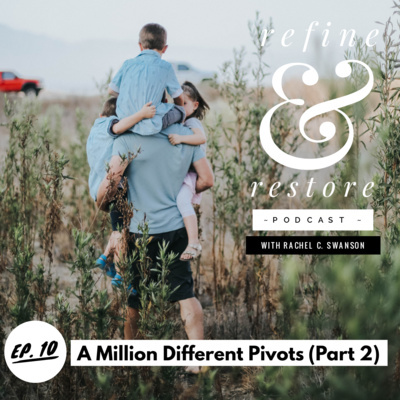 In this episode we cover: What it's like in different stages of motherhood when it comes to feelings of control over our kids. What Jennifer really thinks about the statement "Just give it to God and it will all work out." How we have a certain amount of responsibility on certain things that are in our control. Why she believes that when life hits you with the unexpected, the harvest will still come. 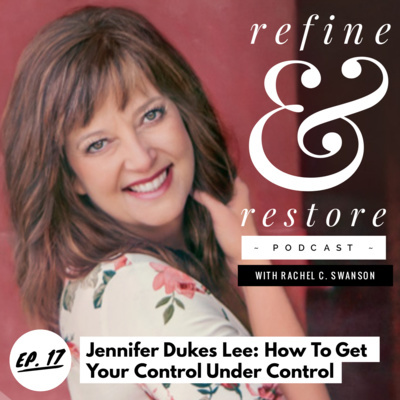 I hope this episode opens your eyes to the possibility that you may have unhealthy control issues and how to navigate this area of relentless control in a healthy, biblical way. Grab Jennifer's book It's All Under Control Connect with me on Facebook! Connect with me on Instagram! If you haven't already, join the Inner Circle with my weekly Truthful Tuesday emails where I provide coaching tips, encouragement, and share behind-the-scene updates about my faith-led adventures! 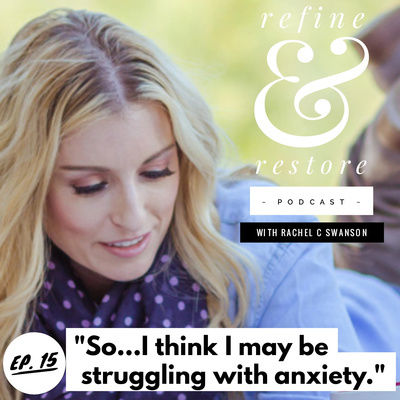 15: "So...I think I may be struggling with anxiety." 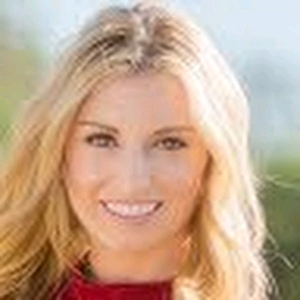 Stasi Eldredge is a best-selling author and co-creator of Ransomed Heart ministries. 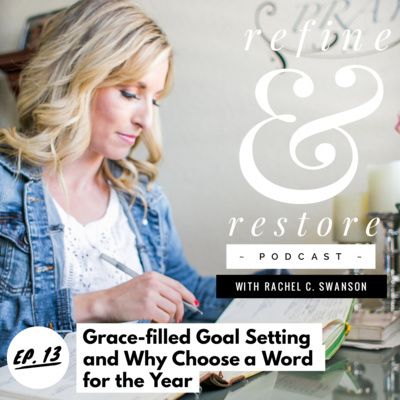 She and her husband love writing and speaking about the goodness of God despite challenges we face. 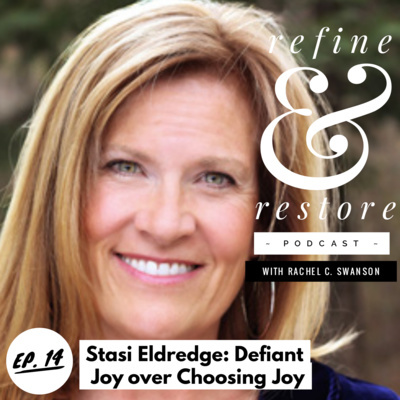 In this episode, Stasi discusses how you can still claim defiant joy amidst life difficulties. It's different than simply choosing joy, which seems to dismiss the reality of hardships going on around us. Instead we can have defiant joy, which acknowledges the pains of what is but also remember the joys we already have in Jesus. If you want to hear about: What we believe the Bible says about prosperity verses suffering What to do that will help when you're faced with a sudden hardship What NOT to do when you're faced with a hardship How Stasi and I battle with contentment and joy amidst our body image struggles (especially post-holidays) Want to grab a copy of Stasi's book, Defiant Joy? Buy it here! https://amzn.to/2BOiGvA Tune in to listen to this episode today! Last week, I talked about the beginning and how this whole ranch adventure, my husband quitting his job, the RV and us moving from California to Idaho first started. 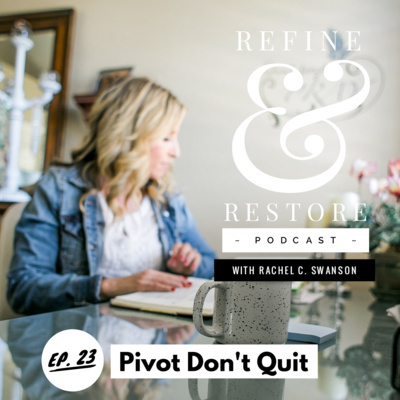 The decision for my husband to quit his job was the pivotal decision that created a wake of change and propelled us onto an adventure with God we never even saw coming. But if you think this transition was seamless, think again. No, it brought us on a million different pivots and a million different decisions to make, ultimately propelling us to one main purpose. A purpose and mission for which we are still discovering and unwrapping right now. Just so you don't think we're super human and super spiritual: - I made a few impulsive decisions that my husband wasn't too thrilled with. - This leap of faith hasn't been without some financial planning on our part, making this transition a lot easier than it would have been. - We still aren't quite making it each month without my husband working (even in a lower income area like the rural hills of Idaho) but I'm thankful for my business ministry, book contracts, and the coaching clients I get to serve. - I had a full-blown panic attack when we arrived at the ranch. So no, I'm not super human. - We've both been struggling with fear multiple times and the inconvenience this has brought to our lives has stretched us thin (me more than him). BUT, we've also been experiencing something incredible through this process. Something that feels almost like I imagine Peter feeling walking on water toward Jesus. An indescribable experience and connection to Him. Seeing how He is using us in ways we never anticipated which has swollen our hearts with such incredible purpose. Doing work too big for us to handle but totally possible with God. Our hearts feel more alive than we've ever felt before and God continues to give us affirmations that we are doing the right thing. Friend, I believe you can experience this too. Perhaps you just need to know someone else who has already taken this leap and can tell you, "It's worth it! Trust me!" Tune in to listen, today! 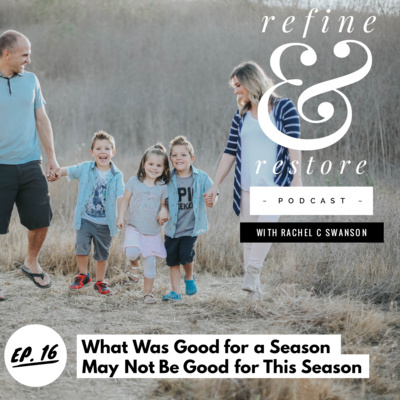 Look up Refine and Restore Podcast on your podcast player! Find me on Facebook! Find me on Instagram! Join my Truthful Tuesday's email list and get your free gift, my e-book called Purpose Manifesto, today! Have you ever felt stuck and didn't see any other options for another way out? My husband and I were there not too long ago and we wanted to invite you into our journey and story over the past 6 months of why he quit his job without another one in sight and the path its taken us on which involves partnering on a dream we never, ever saw coming. 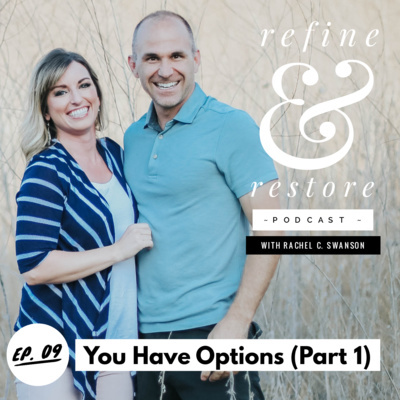 In this episode, me and my husband share candidly about the struggles we were facing and the decisions we made which changed the trajectory of our life. Sometimes you have to take that leap of faith to experience all that God has for you. The most difficult part though is the leap, because often times you don't see where you're going or what's going to happen but have a deeper conviction of something more...that God is leading and that's all that matters. Follow along on Facebook or Instagram by following me at Rachel C. Swanson! www.RachelCSwanson.com Pretty, please leave a review on iTunes! It really does help!! Thanks! I'm sharing my very personal story of the journey my husband and I went on because of God's leading. However, it didn't go as planned in the end. Often when this happens, we question whether or not it was true, or wonder if we heard God correctly. We wonder if God is really good when He clearly told us to do something but it's as if He changed His mind during the process and we are left empty handed. We wonder if He is trustworthy or if He is loving when the refining process hurts or makes us confused, especially when He invites us to do something risky with Him. I invite you into my wrestling journey with Him and what actually happened in our fost-adoption journey that came to a heart-breaking end. 01: "I don't have what it takes..."
Episode 00 - Why this podcast? 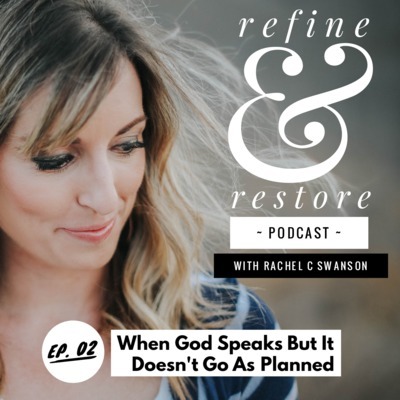 Welcome to the Refine & Restore podcast! 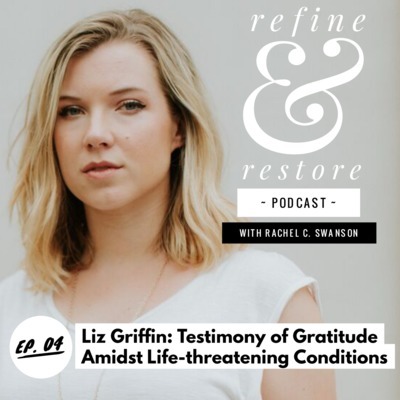 In this early pre-release episode where I (Rachel) discuss why there's a need for this podcast, what it's all about, and one powerful life-changing insight God shared with me a few years ago that will change your life and thinking, today! Also, I have a HUGE giveaway for over $300 worth of goodies you can collect by entering to win before September 1st, 2018! Giveaway Details: 75 min life + stress management coaching session with Rachel + $100 worth of swag bag goodies of my favorite things (may include a signed copy of my best-selling book! 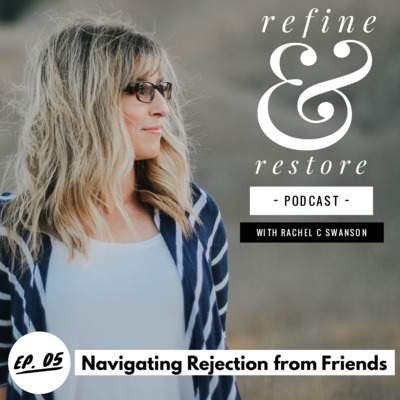 *wink wink*) >>To Enter: 1) Subscribe to this podcast 2) Screenshot that you subscribed and share on Facebook or Instagram 3) Tag me (IG: @rachelcswanson or FB page: @rachelswansonofficial) + use the hashtag #refineandrestore in your post or story! That's it! I will save these tags as entries and select a winner on the official launch day September 1st! Can't wait to connect with you more soon!